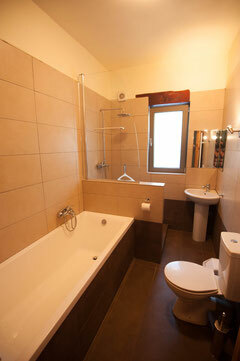 En-suite bathroom with a basin toilet and shower in the master bedroom ready to enjoy close by your bed. Who has the priority to join that all simply allone directly off the bed? Every tap in the house has pure drinking water, high water pressure operated by booster pumps support you with water from the wells of the Apokoronas region. Experiencing enjoyable showers on your skin. A second bathroom with bathtub is available and can be used to enjoy reading and fantasizing in water heated up by sunlight energy. Soft hand- and bath towels in three different natural African colors. Shiny chrome covered iron to place the towels on after taking a shower or bath.